Despite a huge amount of research investiment during the past three decades there is still no cure or disease-modifying therapy of any kind for Alzheimer's disease, and only very limited progress has been made since the millenium. This review provides a perspective on how Alzheimer's disease symptoms are currently treated with pharmacological and non-pharmacological approaches, and what the evidence for each is. In the absence of new drugs, it is remarkable how well medical foods and behavioural interventions fare in comparison, although much research is still required. A true causal therapy of Alzheimer's disease will have to await the unvailing of its ultimate cause. Alzheimer's disease (AD) has an insidious onset, and therefore, experiencing increasing cognitive deficiencies is always a severe concern for the affected individual and his or her personal associates. While subjective cognitive decline (SCD) in individuals who do not show impaired performance on the usual cognitive tests is an attractive research subject for which a conceptual framework has recently been defined, such self-reported impairments can have many physiological and psychological reasons. Even mild hypohydration (loss of <1% body mass) can reversibly impair cognition, and 24 weeks of systematic moderate exercise alone can improve executive function in older adults reporting SCD. Although most who subsequently develop dementia of any type will have experienced SCD as a prodromal symptom, SCD has low predictive value in this respect, except in individuals attending a memory clinic. No pharmacological intervention is appropriate. One month of simultaneous memory training and aerobic exercise is sufficient to improve memory, attention and reasoning abilities in older adults reporting SCD. In contrast with SCD, individuals with mild cognitive impairment (MCI) do have demonstrable impairment in cognition tests but not to a degree that meets the criteria for dementia. There is generally mild functional impairment for complex tasks, but basic activities of daily living (ADL) are preserved. The prevalence of MCI in adults aged 65 years and over is 10%–20%, and about 10% of those diagnosed with MCI progress to some type of dementia each year, compared with 1%–2% of the general elderly population. Dehydration, infections, anticholinergic drugs, thyroid dysfunction and other chronic diseases, alcohol abuse and various lifestyle factors can cause symptoms of MCI that are wholly or partially reversible on elimination or treatment of the root cause. Depression, from which one in three aged persons with MCI suffers, will also reversibly compromise cognition. It is the amnestic MCI form (aMCI), where memory loss is the chief concern, that has the highest risk of progression to AD, and might be considered a prodromal stage. There is a diagnostic continuum: distinction between aMCI and mild AD depends on the examining psychiatrist's judgement on whether or not 'mild problems performing complex functional tasks' already cause 'significant interference in the ability to function at work or in usual daily activities'. The great majority of individuals diagnosed with mild or very mild AD will meet criteria for MCI due to AD as well. There are no drugs approved for the treatment of MCI, and although studies have been conducted with antidiabetics, statins, Vitamins E and B12, melatonin and various dietary interventions none has produced sufficiently robust evidence so far. However, the diagnostic continuum between aMCI and 'preclinical' and 'very mild' AD, the latter of which is eligible for treatment with cholinesterase inhibitors (see the discussion of definitions, below) blurs the distinction on the level of routine psychiatric practice. In any case, medications with anticholinergic effects should be discontinued or reduced as far as possible, and special attention should be directed at the control of diabetes. There are two current diagnostic definitions of AD for research purposes that differ only in details: Those of the United States National Institute on Aging and the Alzheimer's Association (the 2011 NIA-AA criteria), and those published by the International Working Group (the 2014 IWG-2 criteria). The major difference between the two sets is that the IWG-2 criteria cover a prodromal stage that is essentially identical to aMCI. Otherwise, the differences are mostly on the semantic level (the IWG-2 'atypical AD' corresponds to the NIA-AA 'probable AD'). Both include recommendations for using and interpreting molecular and imaging biomarkers to support the diagnosis. Although both sets of criteria were originally intended mainly for defining study populations for inclusion in AD clinical trials, their use has been adopted into general practice, extending the original International Classification of Disease-10 and Diagnostic and Statistical Manual of Mental Disorders, 4th edition criteria from the 1990s which had solely relied on neuropsychiatric examination. Their importance lies in the fact that they not only facilitate an early diagnosis of possible or probable AD but also improve the differentiation against other forms of dementia, which is essential for adequate medical treatment and care of AD patients. This grading can be further refined by more detailed neuropsychological tests, such as the cognitive subscale of the AD Assess Scale (ADAS-Cog) for questionable, mild and moderate AD, and with the Severe Impairment Battery for severe AD. Determining the stage of AD is important not only for determining the level of care and nursing but also for therapy: not all AD drugs are approved and/or reimbursed for all degrees of AD severity. The entire field of neuropsychiatry has not seen fundamentally new or significantly more effective drugs for many years. For AD, this dearth of innovation is extremely pronounced: no new drugs have been widely approved during the past 15 years despite most impressive investments in research and development (This sharply contrasts with the series of new developments around the millennium which ended a long-lasting 'pharmacological nihilism' and provided us with the approved specific AD drugs used today). The treatment of behavioural symptoms has to rely on established antidepressants and antipsychotics that are not specifically approved for BPSD or AD. Four agents are currently approved for the treatment of AD core symptoms: three cholinesterase inhibitors (donepezil, rivastigmine and galantamine) and the open-channel NMDA antagonist, memantine. All these agents were originally approved during the late 1990s and early 2000s based on their superiority over placebo at the endpoint of clinical trials with limited duration (usually, 24 weeks). Longer-term trials later extended the base of experience and controlled conditions. Recent years have seen extensive discussions concerning the usefulness of these drugs for patients, as well as their cost-effectiveness. Challenges are frequently brought based on the small-to-moderate cognitive effect strengths seen in randomised and controlled clinical trials, especially in the later stages of AD, and on the fact that they do not modify the chronically progressive course of the disease i.e., these drugs can slow cognitive decline only as long as they are administered. Pharmacoeconomic studies and meta-analyses of such studies, that are critical of AD drugs continue to be published. Parts of these discussions are rooted in the fact that health insurers and health technology assessment agencies employ criteria of usefulness and cost-effectiveness that are much broader than the core symptom criteria used for regulatory authorities; generally, they also include BPSD, reduction of disease-specific mortality and delay or reduction of nursing demands in their assessments. Caregivers also tend to expect 'Alzheimer drug' to be broadly effective in all dimensions. However, it is precisely the fact that AD is a disease without spontaneous remissions, with an extremely high burden of disease for patients and their caregivers alike, that justifies its symptomatic treatment even with drugs of limited effectiveness. All three cholinesterase inhibitors are generically available as orally formulated drugs; rivastigmine is also available as a once-daily transdermal therapeutic system. All are approved for the treatment of mild-to-moderate AD; the United States Food and Drug Administration extended the original 1996 approval of donepezil to severe AD in 2006, making it the only drug approved for the treatment of AD across the severity spectrum until 2013, when FDA approval for the rivastigmine patch was also extended to severe AD. However, the European Medicines Agency did not grant approvals beyond the moderate stage of AD. As a consequence, the European national AD treatment guidelines also make no such recommendation, although most concede that treatment continuation into the moderately severe stage might be warranted depending on individual circumstances, at least for donepezil and rivastigmine. The dose and titration schemes for the three agents are summarises in [Table 1]. All cholinesterase inhibitors cause frequent side effects that are mostly gastrointestinal; mainly these are diarrhoea, nausea and emesis. Dizziness, vertigo, headaches and bradycardia can also occur. These undesirable effects are dose-dependently linked to the desired enhancement of the cholinergic system tone. Side effects are mostly manageable and self-limiting, and do not normally require discontinuation of therapy, but they should be continuously monitored by caregivers. Often be can avoided by slowly increasing the initial dose until the recommended maximum dose or the tolerated dose for the patient is reached, whatever is encountered first. Cholinesterase inhibitors are intended to facilitate central cholinergic neurotransmission to compensate for reduced activity of cholinergic projections into cortical regions. Obviously, all medications with anticholinergic effects should be discontinued (if possible) before cholinesterase inhibitors are initiated. While this seems obvious, awareness of the problem of anticholinergic burden in previously untreated AD patients deserves more attention so that treatment response can be optimised, and increased mortality avoided., About a dozen of the psychotropic and cardiovascular drugs that are frequently prescribed to the elderly have some anticholinergic effect. How early should treatment start? A meta-analysis of randomised controlled trials involving community-dwelling adults aged 65 years and older with an MCI diagnosis does not support treatment with cholinesterase inhibitors. Drugs that are approved for AD should not be used in this stage, despite some positive study results for each of the agents, because the risk-benefit balance does not warrant it., In any case, this would be an off-label use, burdening the prescribing physician with responsibility and putting the patient outside the envelope of health insurance refunds. However, the consensus is that AD should be treated as early as possible and the issue of differential diagnosis additionally complicates the situation: as discussed above, aMCI and mild AD are ultimately separated only by a fine line of expert assessment that will in part rely on statements from spouses and relatives, and will always have a subjective component. While MCI (including its amnestic subtype) is a clinically defined entity, it is only with hindsight (if a person previously diagnosed with MCI has developed AD) that his or her MCI can be stated with any degree of certainty to have been a prodromal manifestation of AD. A preliminary diagnosis of 'preclinical AD' should, therefore, require evidence for the presence of typical AD pathology (to be obtained by imaging), and possibly supported by testing for apolipoprotein E genotype and other biomarkers (amyloid precursor protein, phosphorylated tau protein) in blood or liquor. Especially in individuals younger than 65 years and/or with a family history of AD such advanced diagnostics will support the notion that the border between MCI and AD has already been crossed, and that treatment with cholinesterase inhibitors is warranted. The Cochrane Network published its first individual systematic reviews for donepezil, rivastigmine and galantamine in 2005, and followed up with a summary comparison for all three drugs 1 year later. The reviewers found all three cholinesterase inhibitors to be efficacious for mild-to-moderate AD, with no significant differences in efficacy and (most likely) in tolerability between them, despite their slightly different mechanisms (Rivastigmine is an irreversible inhibitor while the others are reversible; galantamine exerts additional cholinergic action by modulating neuronal nicotinic acetylcholine receptors). Improvements in cognitive function, on average of 2.7 points, in the midrange of the 70-point ADAS-Cog Scale were seen, and also benefits on measures of ADL (weighted mean improvement, 4.4 and 2.5 points on the Disability Assessment for Dementia and Progressive Deterioration scales, respectively) and behaviour (2.4-point improvement in the neuropsychiatric inventory). Although none of these treatment effects were large, the reviewers concluded that there is no evidence that treatment with a cholinesterase inhibitor is not cost effective. Importantly, the Cochrane meta-analysis found no identifiable predictors for response to treatment. How long is cholinesterase inhibitor treatment meaningful? Only about 10% of AD patients maintain stable cognition test results with continued drug refill for more than 3 years. There is no consensus in practice guidelines and recommendations concerning at which point in the disease course, if at all, cholinesterase inhibitor treatment should be discontinued. In effect, this decision will have to be made on an individual assessment. DOMINO-AD, a study conducted in the United Kingdom that had not been sponsored by industry, has investigated 295 patients with moderate or severe AD who had been on stable donepezil treatment for at least 3 months, with the highest recommended dose (10 mg/day) for at least 6 weeks. Practically, all patients had a much longer overall treatment history: 85% had been treated for at least 1 year, 14% for more than 5 years. After 52 weeks, patients assigned to continue donepezil scored an average of 1.9 points higher on the MMSE, as compared with those assigned to discontinue donepezil. This exceeded the minimum clinically important difference of 1.4 points. Furthermore, their score on the 60-point Bristol ADL Scale was better by 3.0 points which was statistically significant but did not quite meet the clinical importance threshold of 3.5 points. Continuing donepezil for 52 weeks was more cost-effective than discontinuation, considering cognition, ADL and health-related quality of life. There have been no large blinded trials demonstrating that transiting patients who do not show the satisfactory response to any one of the three cholinesterase inhibitors to another one is beneficial, although some open studies have been published., However, there is no evidence for detrimental effects either. Switching cholinesterase inhibitors for the above-mentioned reasons seems perfectly acceptable, especially if the original drug is not well tolerated. Memantine is a non-competitive open-channel NMDA receptor antagonist that is primarily intended to slow neurodegeneration caused by neuronal overexcitation. It is approved for the treatment of moderately severe (MMSE score 10–19 points) and severe (0–10 points) AD, but not for mild AD. This fills an important gap in the pharmacological treatment of more advanced AD. A 4-week titration to the maximal recommended dose (20 mg/day) is recommended. Initially, health-care assessment organisations, especially in the United Kingdom and Germany, had been skeptical concerning the effectiveness of memantine in this patient segment based on their own analyses of available data. While they have meanwhile revised their negative original assessments, discussions continue to this day. The bottom line is that, at least in severe AD, memantine monotherapy is broadly recommended as the single available option. A systematic review and meta-analysis of double-blind, placebo-controlled clinical trials that included 18 studies involving 5004 patients and was published in 2018 found memantine to be only slightly more efficacious than placebo on cognitive function, global symptomatology, neuropsychiatric symptoms and discontinuation due to inefficacy. This finding is consistent with previous Cochrane analyses which found a small beneficial effect at 6 months in moderate to severe AD. As memantine and cholinesterase inhibitors are all approved for moderate AD and have completely different modes of action, synergies could be expected from combination treatment. Indeed, the retrospective MEMAGE study reported moderately significant improvements in MMSE and Neuropsychiatric Inventory scores when memantine 20 mg/day was administered for 6 months in addition to donepezil or rivastigmine in AD patients with worsened cognitive functions and behavioural disorders. However, the benefits of this add-on treatment seem to shrink as the data pool grows. A meta-analysis of 11 studies published between 2004 and 2015 found that the combination of donepezil and memantine led to mildly better improvement in cognitive functions, BPSD and global functions than did donepezil alone in patients with moderate-to-severe AD, both in the 24th week of treatment and at the final evaluation point that extended to 52 weeks for some of the analysed studies. The European Academy of Neurology suggests using a combination of a cholinesterase inhibitor with memantine in patients with moderate to severe AD but notes that the strength of this recommendation is weak. This opinion is only partially shared by some national authorities including the German one, which recommends considering add-on therapy with memantine only in patients with severe AD. A fixed-dose combination of donepezil and memantine was launched in the United States in 2015, but the European Medicines Agency rejected the marketing application in 2012. A standardised extract from Ginkgo biloba leaves (EGb 761) has a long use history in cognitive impairments and dementia. Its efficacy seems to be rooted in the synergy of several compounds, as no single constituent was ever found responsible. There are pronounced vascular effects that might allow the cerebrometabolic component of AD to be treated. The positions of national regulatory authorities are inconsistent, with no explicit approval for AD but sometimes broad approvals for dementia. For example, Germany has approved EGb 761 for 'cerebrally caused mental impairments in dementia syndromes' and includes it in the list of drugs whose cost is reimbursable by health insurance. Other countries, such as the United States, consider Ginkgo extracts to be dietary supplements. Many clinical studies with EGb 761 have been published, creating a body of evidence that is quite heterogeneous. This is largely because most of these studies were conducted in mixed patient collectives which included AD, vascular dementia and mixed dementia patients. Results have been subjected to meta-analyses which suggest that Ginkgo extract offers improvement over placebo in terms of cognitive performance, ADL and clinical global impression in the treatment of dementia of any type at doses >200 mg/day (usually 240 mg/day) administrated for 22 weeks or longer, with few undesirable side effects. A 2016 meta-analysis of 21 randomised clinical trials reported improvements in MMSE and ADL scores of AD patients after 24 weeks of treatment but cautioned that these findings need to be interpreted with caution due to limited sample size, inconsistent findings and methodological quality of included trials. Assessments by German and the UK health-care technology assessment agencies (which usually are very critical of drugs) concur that there are clear indications for cognitive and psychopathology benefits of EGb 761 in AD as well as in other dementia syndromes, and that the possible benefits outweigh the treatment risks. A pharmacoeconomic analysis found the benefit of treatment with EGb 761 (240 mg/day) to correspond to a delay in ADL deterioration by 22.3 months compared to placebo. Vitamin E is a nutritional antioxidant, cheap and Generally Regarded As Safe and often used as a processed food preservative. Because free radicals are broadly involved in neurodegeneration, using a natural scavenger has a reasonable rationale. Indeed AD patients have lower average plasma levels of vitamin E, carotene, lutein and other lipophilic antioxidants when compared with cognitively unimpaired controls,, and there is some evidence from animal models. However, clinical trials for AD have not produced conclusive evidence for the effectiveness of Vitamin E in therapeutic or preventive settings. A 2017 Cochrane review found no evidence that the alpha-tocopherol form of Vitamin E given to people with MCI prevents progression to dementia, or that it improves cognitive function in people with MCI or AD, although the authors note a single study suggesting that it may slow functional decline in AD. Results from the PREADViSE study which had followed thousands of initially asymptomatic elderly men at 130 sites, randomised to vitamin E, selenium, Vitamin E plus selenium or placebo, for up to 13 years provided no evidence that either agent prevented AD. While Vitamin E precipitated no adverse events in these trials which employed recommended doses, it is worth noting that supraphysiological megadoses have increased the frequency of cardiovascular events in trials that investigated other medical conditions. Epidemiological and observational studies have provided suggestions that persons who use common non-steroidal anti-inflammatory drugs have a reduced risk of developing AD. This effect, which is not seen with anti-inflammatory corticosteroids, is also observed in a meta-analysis of cohort studies but randomised controlled trials that have been conducted with aspirin, naproxen, diclofenac, indomethacin and others have never confirmed a protective or therapeutic effect. Given the significant gastrointestinal side effects of these drugs and the cardiovascular risks that are associated with the selective cyclooxygenase-2 inhibitors (the 'coxibs'), especially with long-term use in higher doses, no recommendation can be given at this time in the context of AD prevention or treatment. A similar situation exists with post-menopausal hormone therapy: women are more frequently affected by AD than men, and younger age at menopause (spontaneous or surgically induced) is associated with an enhanced risk of developing AD, but again there is no conclusive evidence that oestrogen replacement therapy has preventive or therapeutic effects., Given its well-known risks (thrombosis, ischaemic stroke and mammacarcinoma), hormone replacement therapy should not be used to treat cognitive impairments or to prevent their progression, in post-menopausal women. Compounds with various pharmacological mechanisms that are traditionally subsumed under the term 'nootropics' have a decades-long history of use to treat dementia syndromes. Piracetam, semi-synthetic ergot alkaloids (nicergoline and hydergine), certain calcium channel blockers such as nimodipine, and other agents belong in this category. None has produced robust evidence of effectiveness in AD. Cerebrolysin (an injectable standardised peptide product from porcine brain) is, to a degree, an exception: a recent meta-analysis has shown 30 ml/day to be significantly more effective than placebo at 4 weeks and 6 months in terms of combined effect of global clinical change and cognitive function, although the improvement in cognition alone was not clinically relevant. This is not sufficient to recommend use of cerebrolysin, which is mainly popular in Eastern Europe and Asia, for general use in AD. Medical foods (a misnomer because they are not foods in the common meaning of the term; rather, they are intended to compensate specific nutritional deficiencies) occupy an interesting intermediate position between nutritional supplements and over-the-counter drugs. They are available without a prescription and are generally not reimbursed by healthcare providers. Several medical foods that claim to improve neurotransmission and stabilise neuronal membranes in dementia are available on major national markets; the most established trade names are Acutil®, Axona®, Cerefolin® and Souvenaid®. They contain ω3-unsaturated fatty acids and phospholipids, antioxidants, vitamins and trace elements; Acutil® also contains a Ginkgo extract at low dose. At present Souvenaid® (which is composed of docosahexaenoic acid and its precursor eicosapentaenoic acid, uridine, choline, folate, Vitamins B6, B12, C and E, phospholipids and selenium) is the product with the best preclinical and clinical evidence in AD. In patients with mild AD who had not yet been treated with cholinesterase inhibitors, improvements were found in some cognitive and neuropsychiatric parameters, but no significant additional improvements on the ADAS-Cog scale were seen overall in patients with mild or moderate AD who were treated with approved dementia medications and took Souvenaid® as an add-on. A meta-analysis of these randomised trials found only non-significant differences versus placebo in cognition and function. However, Souvenaid® does not seem to have side effects when taken at the recommended dose and might confer benefits in early AD. BPSD describes the non-cognitive psychopathology that develops because of structural and metabolic changes in the degenerating brain, usually from multifactorial causes. Their prevalence is high and increases with the severity of cognitive decline. Depression and apathy are common in AD patients; anxiety, irritability, agitation, aggression and other challenging behaviours are often triggered by hallucinations and other psychotic symptoms, or by seemingly innocuous changes in the patients' physical or social environment. BPSD are frequently experienced as being more burdensome for the patient and the caregivers than cognitive impairment. They are usually quantified by the Neuropsychiatric Inventory (which captures 12 domains of psychiatric and behavioural symptoms), or more specifically by the behavioural pathology in AD (BEHAVE-AD) scale. Randomised controlled trials with cholinesterase inhibitors frequently employ these scores as secondary endpoints. The Cochrane meta-analyses of such studies indicate no benefit for donepezil, a minimal (but clinically irrelevant) benefit galantamine in mild and moderate AD, and an equally minimal effect of memantine in moderate-to-severe AD [ref. 36]. In summary, approved antidementives do not seem to have had a discernible overall benefit for BPSD in controlled trials. Individual experiences can of course differ. There are many anecdotal reports from caregivers to the effect that BPSD of moderately progressed AD patients might worsen when successful treatment temporarily improves their impaired cognition, probably because they regain some insight into their condition. This phenomenon had not been systematically investigated. This leaves the physician with the established non-AD-specific drugs to treat those facets of BPSD that cannot be managed by psychosocial interventions: Antidepressants and anxiolytics for depression and anxiety, antipsychotics for hallucinations and aggression. Very often this presents a therapeutic dilemma because many of these psychotropic drugs worsen cognition or other features that are already impaired in the vulnerable AD patients. It is self-evident that drugs with anticholinergic potential should be avoided in AD patients, who already suffer from a cholinergic deficit. Sedating medication will also compromise cognition and can increase risk of falls. Finally, the increased risk of drug interactions in polypharmacy, which is especially severe in the elderly, has to be considered. As far as clinical or caregiving circumstances allow, drug therapy of BPSD in AD should be considered only as an add-on to psychological interventions. These will include the systematic ones described for cognition but could be as simple as giving the patient emotional attention and providing a suitably adapted living environment. It is unknown whether the etiology of depressive disorders in AD patients is fundamentally different from that of non-demented individuals, although this could be of crucial importance for drug therapy. Old tricyclic antidepressants have significant anticholinergic effects; while they might have the same or better antidepressant effect as selective serotonin reuptake inhibitors, they are clearly inferior in general dementia patients in terms of severe adverse events and dropout rates. This has been demonstrated in several randomised active-comparator trials, for example, for imipramine versus paroxetine and amitriptyline versus fluoxetine. In a recent meta-analysis of studies with AD patients, the overall efficacy of antidepressants of all types was absent, although the quality of the evidence was moderate because of methodological limitations in studies and the small number of trials. Nevertheless, surveys show a significant percentage of AD patients being treated with antidepressants because individual studies published during the past two decades (see above) did show some effect; this is also reflected in most national treatment guidelines, which only warn against tricyclic antidepressant. In contrast, there is no evidence, and no recommendation, for using benzodiazepines to treat anxiety in dementia. While haloperidol should be avoided because of its propensity to extrapyramidal side effects, many countries have approved the atypical antipsychotic, risperidone to treat psychosis and chronic severe aggression in dementia patients. Of the other atypical antipsychotics, aripiprazole can be considered as an alternative while olanzapine should be avoided because of its anticholinergic effect. However, this is a measure of last resort, and the use of risperidone in otherwise intractable psychomotor agitation should be limited to brief periods. The practice of routinely administering antipsychotics as sedatives at bedtime (still common in some nursing institutions) must be firmly rejected. A Cochrane meta-analysis has confirmed the efficacy of risperidone with respect to agitation and aggression in dementia, but it has also documented increased frequency of cerebrovascular events, extrapyramidal symptoms and increased overall mortality. Disturbed night rest and circadian rhythm desynchronisation are very common in AD, and extremely burdensome for caregivers. However, popular hypnotics must be used with great caution because they compromise cognition and increase the risk of falls. Melatonin improves neither sleep nor agitation in institutionalised AD patients, and neither does light therapy in the morning alone; but a combination of both increased daytime wake time and activity levels and strengthened the rest-activity rhythm in a small clinical study. In the absence of recently published research, no recommendation is being given; on the other hand, there is hardly any potential for harm. Well-controlled interventions that do not involve drug therapy can not only improve BPSD but also maintain or improve patient's cognitive function and their ADL. Non-pharmacological interventions are a safe additional treatment option with fewer side-effects than pharmacological therapy and can be divided into four categories: Cognitive methods, holistic technics, brief psychotherapies and alternative methods. 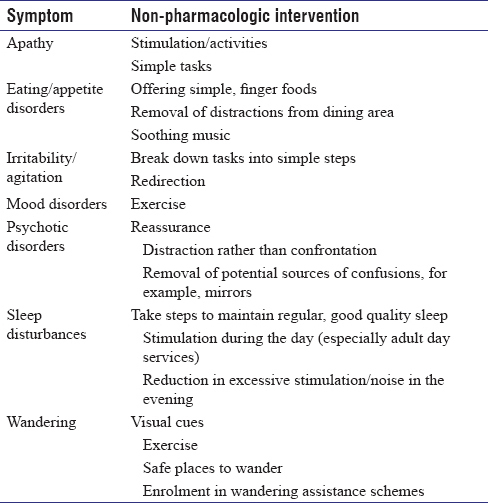 [Table 2] summarises the non-pharmacological approaches for the management of common behavioural symptoms and mood disorders (AD Program, California Department of Public Health). The formal treatment strategies are discussed below. A general problem encountered with the assessment of non-pharmacological interventions is that methodological difficulties and small and heterogeneous sample sizes tend make their interpretation difficult, although there have been welcome improvements in the quality of research. The lack of funding for such studies, which are not backed by industry, is a significant factor in this respect. Participants in several randomised, controlled studies exhibited improvement in cognition, quality of life, well-being, social engagement and depressive symptoms. Meta-analyses have confirmed this, with the Cochrane review demonstrating clear consistent benefit (standardised mean difference 0.41; 95% CE; 0.25–0.57). This remained evident and at follow-up one to 3 months after the end of treatment. There was also some evidence of cost-effectiveness. Other key issues that are related to the use of Central Standard Time are addressed by on-going clinical trials. The WHO mental health-care action programme (mhGAP) calls for the development of cognitive stimulation interventions in which caregivers can be trained to deliver programmes at home and in the community. In dementia patients, long-held memories can remain and are often easily accessible. Reminiscence therapy (RT) encourages patients to speak about past events and their special memories. Tangible aids such as personal belongings, photographs, movies and music are used to evoke memories and stimulate conversation and discussions. RT involves the discussion of memories and past experiences and is administered on an individual basis or in a group setting, focusing on free recall of memories or in the context of a focused life-review. A small size effect of cognitive function and a moderate size effect on depressive symptoms were reported, and RT had no harmful effects., This has also been found In AD patients specifically., There are on-going efforts to support reminiscence and conversation therapy with the newest digital technologies. Reality orientation training (ROT) helps patients with dementia by orienting to time and place. In group sessions, facilitators present personal and current information, calendars, maps, games, puzzles and reality orientation boards are used. In a systematic review of 43 studies of ROT cognitive and behavioural benefits could be documented. Validation therapy (VT) posits that confusion in dementia patients represents an escapist strategy to avoid stress, boredom and loneliness. VT focuses not on what is factually correct but rather on the patient's feelings in the moment of confusion. The facilitator (i.e. the clinician or caregiver) has the responsibility to validate the patient's emotions, and not to focus on the confusion. VT can alleviate stress, increase contentment and decrease behavioural disturbances. MT interventions have been extensively examined. A recent Cochrane review included 22 studies with 1097 randomised inpatients, suffering from dementia of varying degrees of severity. Seven studies delivered an individual music intervention; all others were group interventions. Most interventions involved both active and receptive musical elements. There was low-quality evidence of improvement of emotional well-being, quality of life, reduction of anxiety and depressive symptoms and overall behaviour problems. MT does not improve cognition or decrease agitation or aggression. Simulated presence therapy (SPT) is a new possible approach to treat BPSD that playing video or audio tape recordings of family members to dementia patients. In a Cochrane review, three trials with 144 patients met the inclusion criteria. All the studies compared multiple treatments and the authors were uncertain regarding all the results, and they were unsuitable for a meta-analysis. Additional high-quality studies are needed to investigate the effect of SPT. Pharmacological therapy of AD in all its dimensions has effectively stalled for the past 15–20 years. We do not have drugs available that consistently modify the chronically progressive cognitive decline and impairment of daily living. The components of BPSD have to be treated with drugs that have not been developed for use in AD patients, and often counteract whatever cognitive and ADL benefit cholinesterase inhibitors and memantine can provide. On the other hand, AD will take an individual course in patients. This makes it even more essential to use drug therapy judiciously while adhering to the basis of evidence provided by the analysis of clinical trials, carefully balancing risks and potential benefits on an individual basis. Several of the alternative treatments that have been investigated but do not have their final word out in terms of efficacy have so few (if any) side effects that using them as add-on to approved therapies would seem to carry minimal risk. This applies especially to medical foods and light therapy. As long as, our understanding of the ultimate cause of AD in incomplete, we should look for subgroups that respond to such treatments even if the benefit does not show in the large-scale statistics of pooled meta-analyses. Non-pharmacological interventions will always have to occupy a special and essential place in therapy. While not all of them might be equally effective, and none of them can fundamentally modify the course of AD, they do not adversely interfere with the effects of any drugs, and may provide remarkable (if only transient) individual benefits. Furthermore, they add the essential human element which tends to get lost in pure drug therapy. Jessen F, Amariglio RE, van Boxtel M, Breteler M, Ceccaldi M, Chételat G, et al. Aconceptual framework for research on subjective cognitive decline in preclinical Alzheimer's disease. Alzheimers Dement 2014;10:844-52. Benton D, Jenkins KT, Watkins HT, Young HA. Minor degree of hypohydration adversely influences cognition: A mediator analysis. Am J Clin Nutr 2016;104:603-12. Heath M, Shellington E, Titheridge S, Gill DP, Petrella RJ. A 24-week multi-modality exercise program improves executive control in older adults with a self-reported cognitive complaint: Evidence from the antisaccade task. J Alzheimers Dis 2017;56:167-83. Slot RE, Sikkes SA, Berkhof J, Brodaty H, Buckley R, Cavedo E, et al. Subjective cognitive decline and rates of incident Alzheimer's disease and non-Alzheimer's disease dementia. Alzheimers Dement 2018. pii: S1552-5260(18)33563-5. McEwen SC, Siddarth P, Abedelsater B, Kim Y, Mui W, Wu P, et al. Simultaneous aerobic exercise and memory training program in older adults with subjective memory impairments. J Alzheimers Dis 2018;62:795-806. Behrman S, Valkanova V, Allan CL. Diagnosing and managing mild cognitive impairment. Practitioner 2017;261:17-20. Ismail Z, Elbayoumi H, Fischer CE, Hogan DB, Millikin CP, Schweizer T, et al. Prevalence of depression in patients with mild cognitive impairment: A systematic review and meta-analysis. JAMA Psychiatry 2017;74:58-67. Albert MS, DeKosky ST, Dickson D, Dubois B, Feldman HH, Fox NC, et al. The diagnosis of mild cognitive impairment due to Alzheimer's disease: Recommendations from the National Institute on Aging-Alzheimer's Association workgroups on diagnostic guidelines for Alzheimer's disease. Alzheimers Dement 2011;7:270-9. Bradfield NI, Ellis KA, Savage G, Maruff P, Burnham S, Darby D, et al. Baseline amnestic severity predicts progression from amnestic mild cognitive impairment to Alzheimer disease dementia at 3 years. Alzheimer Dis Assoc Disord 2018;32:190-6. Morris JC. Revised criteria for mild cognitive impairment may compromise the diagnosis of Alzheimer disease dementia. Arch Neurol 2012;69:700-8. Green AR, Oh E, Hilson L, Tian J, Boyd CM. Anticholinergic burden in older adults with mild cognitive impairment. J Am Geriatr Soc 2016;64:e313-4. Yuan XY, Wang XG. Mild cognitive impairment in type 2 diabetes mellitus and related risk factors: A review. Rev Neurosci 2017;28:715-23. McKhann GM, Knopman DS, Chertkow H, Hyman BT, Jack CR Jr., Kawas CH, et al. The diagnosis of dementia due to Alzheimer's disease: Recommendations from the National Institute on Aging-Alzheimer's Association workgroups on diagnostic guidelines for Alzheimer's disease. Alzheimers Dement 2011;7:263-9. Dubois B, Feldman HH, Jacova C, Hampel H, Molinuevo JL, Blennow K, et al. Advancing research diagnostic criteria for Alzheimer's disease: The IWG-2 criteria. Lancet Neurol 2014;13:614-29. Khan TK. An algorithm for preclinical diagnosis of Alzheimer's disease. Front Neurosci 2018;12:275. Tricco AC, Ashoor HM, Soobiah C, Rios P, Veroniki AA, Hamid JS, et al. Comparative effectiveness and safety of cognitive enhancers for treating Alzheimer's disease: Systematic review and network metaanalysis. J Am Geriatr Soc 2018;66:170-8. Ebrahem AS, Oremus M. A pharmacoeconomic evaluation of cholinesterase inhibitors and memantine for the treatment of Alzheimer's disease. Expert Opin Pharmacother 2018;19:1245-59. Park-Wyllie LY, Mamdani MM, Li P, Gill SS, Laupacis A, Juurlink DN, et al. Cholinesterase inhibitors and hospitalization for bradycardia: A population-based study. PLoS Med 2009;6:e1000157. Gill SS, Anderson GM, Fischer HD, Bell CM, Li P, Normand SL, et al. Syncope and its consequences in patients with dementia receiving cholinesterase inhibitors: A population-based cohort study. Arch Intern Med 2009;169:867-73. Isik AT, Soysal P, Stubbs B, Solmi M, Basso C, Maggi S, et al. Cardiovascular outcomes of cholinesterase inhibitors in individuals with dementia: A meta-analysis and systematic review. J Am Geriatr Soc 2018;66:1805-11. Monacelli F, Rosa G. Cholinesterase inhibitors: Cardioprotection in Alzheimer's disease. J Alzheimers Dis 2014;42:1071-7. Ah YM, Suh Y, Jun K, Hwang S, Lee JY. Effect of anticholinergic burden on treatment modification, delirium and mortality in newly diagnosed dementia patients starting a cholinesterase inhibitor: A population-based study. Basic Clin Pharmacol Toxicol 2018. doi: 10.1111/bcpt.13184. [Epub ahead of print]. Cross AJ, George J, Woodward MC, Ames D, Brodaty H, Ilomäki J, et al. Potentially inappropriate medications and anticholinergic burden in older people attending memory clinics in Australia. Drugs Aging 2016;33:37-44. Chew ML, Mulsant BH, Pollock BG, Lehman ME, Greenspan A, Mahmoud RA, et al. Anticholinergic activity of 107 medications commonly used by older adults. J Am Geriatr Soc 2008;56:1333-41. Fitzpatrick-Lewis D, Warren R, Ali MU, Sherifali D, Raina P. Treatment for mild cognitive impairment: A systematic review and meta-analysis. CMAJ Open 2015;3:E419-27. Fink HA, Jutkowitz E, McCarten JR, Hemmy LS, Butler M, Davila H, et al. Pharmacologic interventions to prevent cognitive decline, mild cognitive impairment, and clinical Alzheimer-type dementia: A systematic review. Ann Intern Med 2018;168:39-51. Birks J. Cholinesterase inhibitors for Alzheimer's disease. Cochrane Database Syst Rev 2006;1:CD005593. Sun Y, Lai MS, Lu CJ, Chen RC. How long can patients with mild or moderate Alzheimer's dementia maintain both the cognition and the therapy of cholinesterase inhibitors: A national population-based study. Eur J Neurol 2008;15:278-83. Renn BN, Asghar-Ali AA, Thielke S, Catic A, Martini SR, Mitchell BG, et al. Asystematic review of practice guidelines and recommendations for discontinuation of cholinesterase inhibitors in dementia. Am J Geriatr Psychiatry 2018;26:134-47. Howard R, McShane R, Lindesay J, Ritchie C, Baldwin A, Barber R, et al. Donepezil and memantine for moderate-to-severe Alzheimer's disease. N Engl J Med 2012;366:893-903. Knapp M, King D, Romeo R, Adams J, Baldwin A, Ballard C, et al. Cost-effectiveness of donepezil and memantine in moderate to severe Alzheimer's disease (the DOMINO-AD trial). Int J Geriatr Psychiatry 2017;32:1205-16. Dantoine T, Auriacombe S, Sarazin M, Becker H, Pere JJ, Bourdeix I, et al. Rivastigmine monotherapy and combination therapy with memantine in patients with moderately severe Alzheimer's disease who failed to benefit from previous cholinesterase inhibitor treatment. Int J Clin Pract 2006;60:110-8. Bartorelli L, Giraldi C, Saccardo M, Cammarata S, Bottini G, Fasanaro AM, et al. Effects of switching from an AChE inhibitor to a dual AChE-BuChE inhibitor in patients with Alzheimer's disease. Curr Med Res Opin 2005;21:1809-18. Blanco-Silvente L, Capellà D, Garre-Olmo J, Vilalta-Franch J, Castells X. Predictors of discontinuation, efficacy, and safety of memantine treatment for Alzheimer's disease: Meta-analysis and meta-regression of 18 randomized clinical trials involving 5004 patients. BMC Geriatr 2018;18:168. McShane R, Areosa Sastre A, Minakaran N. Memantine for dementia. Cochrane Database Syst Rev 2006;2:CD003154. Gareri P, Putignano D, Castagna A, Cotroneo AM, De Palo G, Fabbo A, et al. Retrospective study on the benefits of combined memantine and cholinEsterase inhibitor treatMent in AGEd patients affected with Alzheimer's disease: The MEMAGE study. J Alzheimers Dis 2014;41:633-40. Chen R, Chan PT, Chu H, Lin YC, Chang PC, Chen CY, et al. Treatment effects between monotherapy of donepezil versus combination with memantine for Alzheimer disease: A meta-analysis. PLoS One 2017;12:e0183586. Schmidt R, Hofer E, Bouwman FH, Buerger K, Cordonnier C, Fladby T, et al. EFNS-ENS/EAN guideline on concomitant use of cholinesterase inhibitors and memantine in moderate to severe alzheimer's disease. Eur J Neurol 2015;22:889-98. Yuan Q, Wang CW, Shi J, Lin Z ×. Effects of Ginkgo biloba on dementia: An overview of systematic reviews. J Ethnopharmacol 2017;195:1-9. Yang G, Wang Y, Sun J, Zhang K, Liu J. Ginkgo biloba for mild cognitive impairment and Alzheimer's disease: A systematic review and meta-analysis of randomized controlled trials. Curr Top Med Chem 2016;16:520-8. Rainer M, Mucke H, Schlaefke S. Ginkgo biloba extract EGb 761 in the treatment of dementia: A pharmacoeconomic analysis of the Austrian setting. Wien Klin Wochenschr 2013;125:8-15. Vellas B, Coley N, Ousset PJ, Berrut G, Dartigues JF, Dubois B, et al. Long-term use of standardised Ginkgo biloba extract for the prevention of Alzheimer's disease (GuidAge): A randomised placebo-controlled trial. Lancet Neurol 2012;11:851-9. DeKosky ST, Williamson JD, Fitzpatrick AL, Kronmal RA, Ives DG, Saxton JA, et al. Ginkgo biloba for prevention of dementia: A randomized controlled trial. JAMA 2008;300:2253-62. Mullan K, Cardwell CR, McGuinness B, Woodside JV, McKay GJ. Plasma antioxidant status in patients with Alzheimer's disease and cognitively intact elderly: A meta-analysis of case-control studies. J Alzheimers Dis 2018;62:305-17.
de Wilde MC, Vellas B, Girault E, Yavuz AC, Sijben JW. Lower brain and blood nutrient status in Alzheimer's disease: Results from meta-analyses. Alzheimers Dement (N Y) 2017;3:416-31. Farina N, Llewellyn D, Isaac MGEKN, Tabet N. Vitamin E for Alzheimer's dementia and mild cognitive impairment. Cochrane Database Syst Rev 2017;4:CD002854. Kryscio RJ, Abner EL, Caban-Holt A, Lovell M, Goodman P, Darke AK, et al. Association of antioxidant supplement use and dementia in the prevention of Alzheimer's disease by Vitamin E and selenium trial (PREADViSE). JAMA Neurol 2017;74:567-73. Wang J, Tan L, Wang HF, Tan CC, Meng XF, Wang C, et al. Anti-inflammatory drugs and risk of Alzheimer's disease: An updated systematic review and meta-analysis. J Alzheimers Dis 2015;44:385-96. Zhang C, Wang Y, Wang D, Zhang J, Zhang F. NSAID exposure and risk of Alzheimer's disease: An updated meta-analysis from cohort studies. Front Aging Neurosci 2018;10:83. Fox M, Berzuini C, Knapp LA. Cumulative estrogen exposure, number of menstrual cycles, and Alzheimer's risk in a cohort of British women. Psychoneuroendocrinology 2013;38:2973-82. Depypere H, Vierin A, Weyers S, Sieben A. Alzheimer's disease, apolipoprotein E and hormone replacement therapy. Maturitas 2016;94:98-105. O'Brien J, Jackson JW, Grodstein F, Blacker D, Weuve J. Postmenopausal hormone therapy is not associated with risk of all-cause dementia and Alzheimer's disease. Epidemiol Rev 2014;36:83-103. Gauthier S, Proaño JV, Jia J, Froelich L, Vester JC, Doppler E, et al. Cerebrolysin in mild-to-moderate Alzheimer's disease: A meta-analysis of randomized controlled clinical trials. Dement Geriatr Cogn Disord 2015;39:332-47. Onakpoya IJ, Heneghan CJ. The efficacy of supplementation with the novel medical food, Souvenaid, in patients with Alzheimer's disease: A systematic review and meta-analysis of randomized clinical trials. Nutr Neurosci 2017;20:219-27. Siafarikas N, Selbaek G, Fladby T, Šaltytė Benth J, Auning E, Aarsland D, et al. Frequency and subgroups of neuropsychiatric symptoms in mild cognitive impairment and different stages of dementia in Alzheimer's disease. Int Psychogeriatr 2018;30:103-13. Birks JS, Harvey RJ. Donepezil for dementia due to Alzheimer's disease. Cochrane Database Syst Rev 2018;6:CD001190. Loy C, Schneider L. Galantamine for Alzheimer's disease and mild cognitive impairment. Cochrane Database Syst Rev 2006;1:CD001747. Katona CL, Hunter BN, Bray J. A double-blind comparison of the efficacy and safely of paroxetine and imipramine in the treatment of depression with dementia. Int J Geriatr Psychiatry 1998;13:100-8. Taragano FE, Lyketsos CG, Mangone CA, Allegri RF, Comesaña-Diaz E. A double-blind, randomized, fixed-dose trial of fluoxetine vs. Amitriptyline in the treatment of major depression complicating Alzheimer's disease. Psychosomatics 1997;38:246-52. Orgeta V, Tabet N, Nilforooshan R, Howard R. Efficacy of antidepressants for depression in Alzheimer's disease: Systematic review and meta-analysis. J Alzheimers Dis 2017;58:725-33. Ballard C, Waite J. The effectiveness of atypical antipsychotics for the treatment of aggression and psychosis in Alzheimer's disease. Cochrane Database Syst Rev 2006;1:CD003476. Homolak J, Mudrovčić M, Vukić B, Toljan K. Circadian rhythm and Alzheimer's disease. Med Sci (Basel) 2018;6. pii: E52. Gehrman PR, Connor DJ, Martin JL, Shochat T, Corey-Bloom J, Ancoli-Israel S, et al. Melatonin fails to improve sleep or agitation in double-blind randomized placebo-controlled trial of institutionalized patients with Alzheimer disease. Am J Geriatr Psychiatry 2009;17:166-9. Dowling GA, Burr RL, Van Someren EJ, Hubbard EM, Luxenberg JS, Mastick J, et al. Melatonin and bright-light treatment for rest-activity disruption in institutionalized patients with Alzheimer's disease. J Am Geriatr Soc 2008;56:239-46. Cammisuli DM, Danti S, Bosinelli F, Cipriani G. Non-pharmacological interventions for people with Alzheimer's Disease: A critical review of the scientific literature from the last ten years. Eur Geriatr Med 2016;7:57-64. doi: 10.1016/j.eurger.2016.01.002. Cummings JL, Isaacson RS, Schmitt FA, Velting DM. A practical algorithm for managing Alzheimer's disease: What, when, and why? Ann Clin Transl Neurol 2015;2:307-23. Woods B, Aguirre E, Spector AE, Orrell M. Cognitive stimulation to improve cognitive functioning in people with dementia. Cochrane Database Syst Rev 2012;2:CD005562. doi: 10.1002/14651858.CD005562.pub2. Duan Y, Lu L, Chen J, Wu C, Liang J, Zheng Y, et al. Psychosocial interventions for Alzheimer Y, functioning in people w: A Bayesian network meta-analysis. BMC Geriatr 2018;18:175. Khan Z, Corbett A, Ballard C. Cognitive stimulation therapy: Training, maintenance and implementation in clinical trials. Pragmat Obs Res 2014;5:15-9. World Health Organization. WHO Mental Health Gap Action Program (mhGAP). World Health Organization; 2009. Available from: http://www.who.int/mental_health/mhgap/en/. [Last accessed on 2019 Mar 04]. Huang HC, Chen YT, Chen PY, Huey-Lan Hu S, Liu F, Kuo YL, et al. Reminiscence therapy improves cognitive functions and reduces depressive symptoms in elderly people with dementia: A meta-analysis of randomized controlled trials. J Am Med Dir Assoc 2015;16:1087-94. Woods B, O'Philbin L, Farrell EM, Spector AE, Orrell M. Reminiscence therapy for dementia. Cochrane Database Syst Rev 2018;3:CD001120. Dourado MC, Laks J. Psychological interventions for neuropsychiatric disturbances in mild and moderate Alzheimer's disease: Current evidences and future directions. Curr Alzheimer Res 2016;13:1100-11. Duru Aşiret G, Kapucu S. The effect of reminiscence therapy on cognition, depression, and activities of daily living for patients with Alzheimer disease. J Geriatr Psychiatry Neurol 2016;29:31-7. Astell AJ, Smith SK, Potter S, Preston-Jones E. Computer interactive reminiscence and conversation aid groups-delivering cognitive stimulation with technology. Alzheimers Dement (N Y) 2018;4:481-7. Spector A, Davies S, Woods B, Orrell M. Reality orientation for dementia: A systematic review of the evidence of effectiveness from randomized controlled trials. Gerontologist 2000;40:206-12. Feil N. The Validation Breakthrough. Baltimore, MD: Health Professions Press, Inc.; 1993.
van der Steen JT, Smaling HJ, van der Wouden JC, Bruinsma MS, Scholten RJ, Vink AC, et al. Music-based therapeutic interventions for people with dementia. Cochrane Database Syst Rev 2018;7:CD003477. Abraha I, Rimland JM, Lozano-Montoya I, Dell'Aquila G, Vélez-Díaz-Pallarés M, Trotta FM, et al. Simulated presence therapy for dementia. Cochrane Database Syst Rev 2017;4:CD011882. doi: 10.1002/14651858.CD011882.pub2.